This week has been busy busy busy!! Did you catch me over at the Frugal Girls when I guest posted? I also contributed a post at Mod Podge Rocks and was featured at Road Kill Rescue. 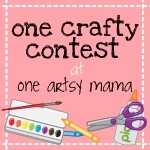 Finally, if you haven't already, please stop by One Artsy Mama before noon eastern today and vote for your favorite washi tape projects for One Crafty Contest. I sure hope you pick mine (even though I can't tell you what that is! ).